Festivals to witness in Singapore! Singapore is a favourite destination among the travellers, one of the reason being its vibrant and joyful atmosphere. 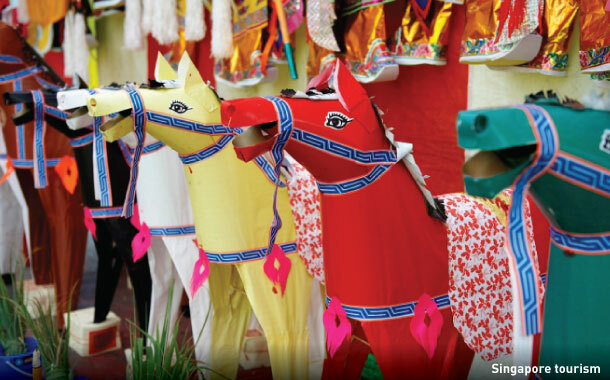 We bring you some of the interesting festivals which will sweep you off your feet! With the increasing tourist flow from India to Singapore, it is easier way to get a Singapore visa for Indian passport holders. Here is a chance to celebrate the night magic in the open streets flourishing with the flavours of art and culture! This heart of Singapore’s art and heritage centre sparkles during this happening festival with marvellous interactive light performances. To add to its magnificence, this festival showcases stupendous dance, music and installation artworks by local talents. You can catch this nocturnal extravaganza at various locations throughout cultural centres which include the National Museum of Singapore, the Peranakan Museum and the Singapore Art Museum. So save your dates for this festival and keep yourself inspired! Where to go: Bras Basah and Bugis precinct, Singapore. Do you love watching horror/ghost movies or have an inclination towards afterlife? Then take one step forward and soak yourselves in the cultural Hungry Ghost Festival held in Singapore, which is similar to the American Halloween. It is believed that during this period, the souls of the dead come down on earth. Not just this, the belief also states that if these souls are ignored, they can turn mischievous. Hence in order to please them, the people make all sorts of incredible offerings. You will see large tents set up in the open fields offering delicious dinners and phenomenal performances which include the Chinese operas, stand-up comedies and wondrous dance numbers. It is a popular belief that if you burn your money in the large bins offered during this festival, you are sure to receive good fortune in the afterlife! Want to take a break from your monotonous routine? Then pack your bags and head to the fabulous Sentosa Buskers Festival at Singapore. The attraction of this festival is the mind-boggling performances by the supreme buskers from Singapore and around the globe. From the age-old traditional juggling to the modern day mime, this entertainment street will delight you with performances from diverse cultures. You can also participate in these fun activities at the Interactive Zone. Beer Garden or Food Street will satiate your appetite for delicious drinks and meals. Visit the Flea Market and you could be lucky to find some amazing valuables. Where to go: Sentosa, Singapore. For all you Formula One fans, the thrilling event is back! This much-awaited night-time motor race event popular for its smooth course and powerful lights has added further charm to the incredible racing game. This world championship event attracts enthusiasts from all over the world entertaining them with a sporty and intense atmosphere. Since Singapore has a tropical climate and reaching this place requires a bit of walking, do carry suitable footwear and a hat for comfort. Popular as a photographer’s paradise, this circuit park will give you plethora of options for that perfect shot. This place has amazing food and beverage outlets delighting the crowd with its delicious local and international cuisines. Where to go: Marina Bay Street Circuit, Singapore.